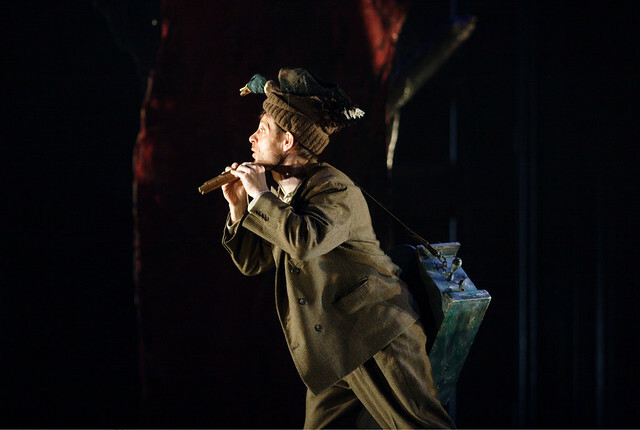 Update 2 March: Cast amendment for Die Zauberflöte and a live broadcast of Guillaume Tell. Further BBC Radio 3 broadcasts of Royal Opera productions during the 2014/15 Season have been announced. These are in addition to previously-announced relays of autumn performances. The repeated broadcast stars Joyce DiDonato, Alice Coote, Ewa Podleś and Eglise Gutiérrez. Bertrand de Billy conducts Massenet's fairytale opera. Plácido Domingo Celebration (2011) on 6 December 2014 at 7.30pm. The repeated broadcast stars Plácido Domingo alongside Ailyn Pérez, Marina Poplavskaya and Francesco Meli. Antonio Pappano conducts extracts of Otello, Rigoletto and Simon Boccanegra. Tristan und Isolde on 29 December 2014 at 5.45pm. The pre-recorded broadcast stars Stephen Gould, Nina Stemme, John Tomlinson and Sarah Connolly. Antonio Pappano conducts the opera, which changed the course of western music through its revolutionary score. Un ballo in maschera on 10 January 2015 at 7.15pm. The pre-recorded broadcast stars Joseph Calleja, Liudmyla Monastyrska and Dmitri Hvorostovsky. Daniel Oren conducts one of Verdi's most sophisticated and subtle scores. Idomeneo on 26 January 2015 at 6.30pm. The pre-recorded broadcast stars Matthew Polenzani, Franco Fagioli, Sophie Bevan and Malin Byström. Marc Minkowski conducts some of Mozart's most varied and inventive music, including the heroic 'Fuor del mar', tender duet ‘S’io non moro a questi accenti’ and the furious vocal acrobatics of 'D'Oreste, d'Ajace'. Andrea Chénier live on 31 January 2015 at 7.15pm. The live broadcast stars Jonas Kaufmann and Eva-Maria Westbroek. Antonio Pappano conducts Umberto Giordano's best-known work, which features the arias 'Come un bel dì di maggio' and 'La mamma morta'. Die Zauberflöte on 13 April 2015 at 7.30pm. The pre-recorded broadcast stars Pavol Breslik, Christiane Karg, Markus Werba and Lauren Fagan. Cornelius Meister conducts Mozart's comic opera, which features the show-stopping aria ‘Der Hölle Rache kocht in meinem Herzen’. Rise and Fall of the City of Mahagonny live on 14 March 2015 at 7.20pm. The live broadcast stars Anne Sofie von Otter, Peter Hoare, Willard W. White and Christine Rice. Mark Wigglesworth conducts Kurt Weill and Bertolt Brecht's satirical opera, which features the diversely-influenced 'Alabama Song', 'Hurricane fugue' and 'Crane duet'. Król Roger live on 16 May 2015 at 6.45pm. The live broadcast stars Mariusz Kwiecień and Saimir Pirgu. Antonio Pappano conducts Szymanowski's sumptuously-scored opera which draws on Byzantine, Oriental and Hellenic influences. La bohème live on 8 June 2015 at 7.20pm. The live broadcast stars Anna Netrebko and Joseph Calleja. Dan Ettinger conducts Puccini's masterpiece which features the aria 'O soave fanciulla' and one of all opera's most dramatic finales. Don Giovanni on 13 July 2015 at 7pm. The pre-recorded broadcast stars Christopher Maltman, Alex Esposito, Albina Shagimuratova, Rolando Villazón, Dorothea Röschmann and Julia Lezhneva. Alain Altinoglu conducts Mozart's tragicomedy, which features some of Mozart’s most dramatic music. Guillaume Tell on 14th July 2015 at 5.50pm. The live broadcast stars Gerald Finley, John Osborn and Malin Byström. Antonio Pappano conducts Rossini's final masterpiece, which features some of his greatest music. All of the titles and broadcast dates listed above are subject to change. Please check BBC Radio 3’s Opera on 3 website for the latest schedule. The live broadcast stars Toby Spence, Janai Brugger, Markus Werba and Anna Siminska. Cornelius Meister conducts Mozart's comic opera, which features the show-stopping aria ‘Der Hölle Rache kocht in meinem Herzen’. Thank you for bringing this to our attention. The casting is now correct on this page (Toby Spence, Janai Brugger, Markus Werba and Anna Siminska).